Showing 35 articles from July 27, 2016. I GOT YOUR SIX. Mike Boncek and Kimberly Brookshire in Youngsville. YOUNGSVILLE -- After an Army career that included two tours in Iraq, there's not much anyone could do to get Michael Boncek to do another single pushup. But to bolster the spirits and help his fellow military men and women suffering from post traumatic stress disorder and committing suicide by the dozens, daily, he'd walk to the ends of the Earth. 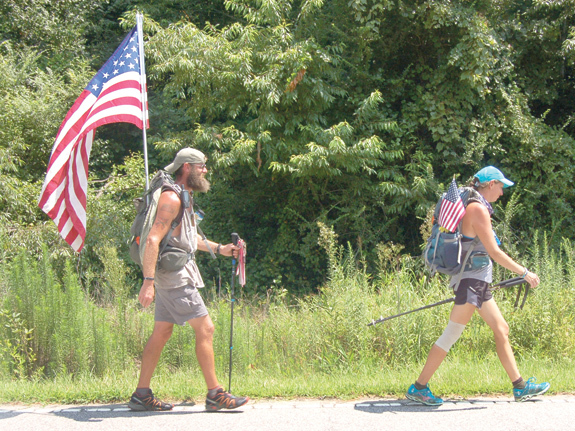 This past spring, he settled for a journey of 2,200 miles -- representing the 22 veterans each day that take their own life. LOUISBURG -- The United Way of Franklin County is under new leadership. 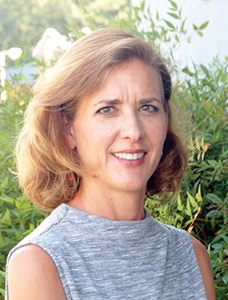 The community networking organization hired Andrea Bell Wright as its executive director. She takes over for Kathy Harrelson, who was terminated this past fall. Wright is the former president of Campaign Resources, Inc., a Raleigh-based fundraising consulting firm. A 'vine' worth clinging to! FRANKLINTON -- Tucked away on the corner of the Franklinton Middle School Campus is a new-concept educational facility called Vine Academy that's scheduled to open next month. It takes its name from Vine Street -- but Principal Zachary Richards has a slightly different spin on the name. He prefers to view the school as a "vine" that will wrap around students, providing them a safe, secure and nurturing environment where they can deal with their special challenges and get back on track. IT WAS OFF TO WORK WE GO! How do you unstuff a school bus? One item at a time -- and it helps if there are many hands to do the work. 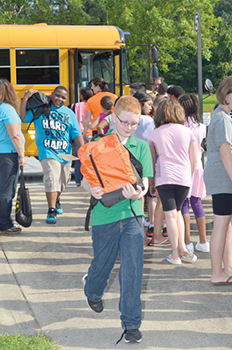 Such was the case last Friday morning at Youngsville Elementary School when Youngsville Masonic Lodge 377 arrived at the school with a big yellow school bus stuffed with fully loaded backpacks and lots of other school supplies. School students were recruited to help unload and that's exactly what John Smith (foreground) and Jeffrey Strong are doing, carrying backpacks into the school lobby staging area while other students line up to help. Hopefully, now that the dust has begun to settle from the Republicans' big party in the Mistake on the Lake, otherwise known as Cleveland, we can review it with 20-20 hindsight, a wonderful skill. 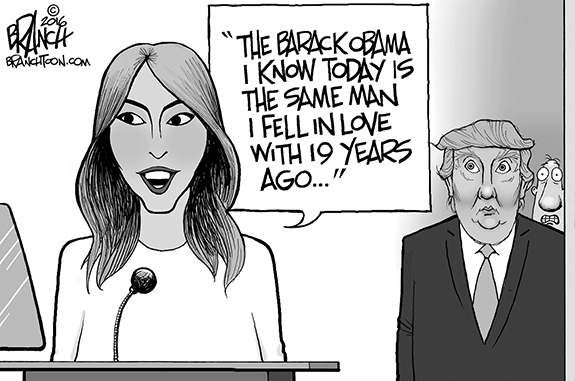 Certainly, they get an A+ for entertainment value, especially if you have a rather warped sense of humor and to be a reporter for more than 10 minutes, your sense of humor better be warped. It's amazing what you can learn in elementary school, sometimes without entering a single classroom! That was the case last Friday morning and the "lesson plan" wasn't exactly one an elementary school teacher might develop for her class. In a nutshell, the topic was how a community operates -- and it was presented in a way and at a level that school children and a number of adults could easily understand. I've covered cops and courts in my time, so I've seen and heard things that, after a period of time, unfortunately, don't jar me or resonate with the effectiveness that they should. That wasn't the case this past Saturday evening, though. 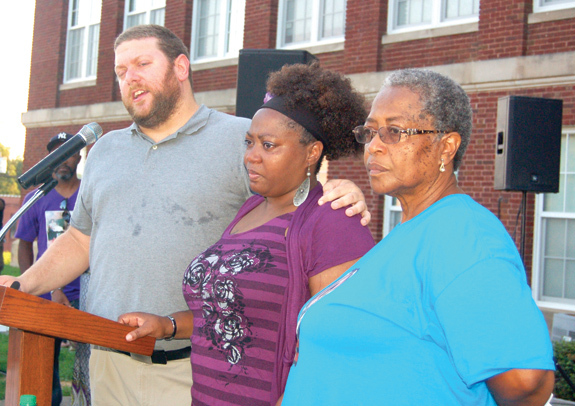 I joined dozens of others who showed up on the lawn of the Franklinton Middle School campus to remember Tracy Williams -- a Franklinton mother of two who died way too soon. 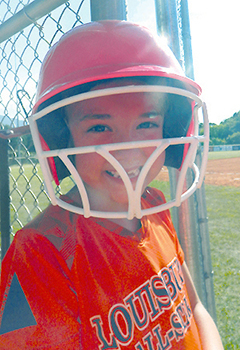 She was killed last July by an estranged boyfriend. Carolina Comeback! Or is it just a Carolina Con Job? 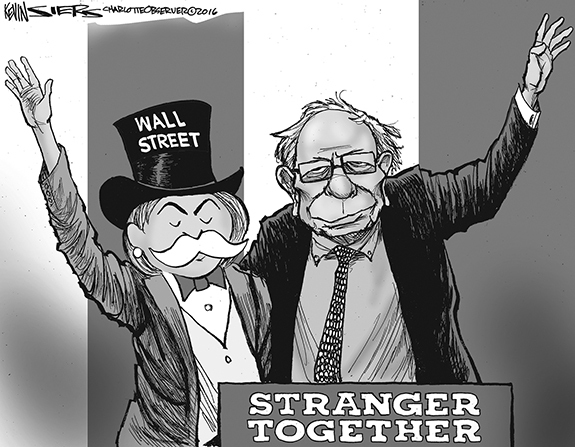 As we end July, the campaign rhetoric is starting to ramp up a bit. After Labor Day, it will be hot and heavy to the point of annoying. In North Carolina, we are hearing a lot about the vaunted Carolina Comeback and I'm willing to bet we will hear a lot more about it from the radicals in Raleigh. North Carolina has looked pretty good in some rankings where the criteria are tailored to make red states look good. Radical Republicans are destroying the country, a charge routinely made by attack puppies for the Democrat Party. Well, of course they are. I bet this just put a big smile on every Liberal's face. Don't go for the popcorn or bubbly just yet. LOUISBURG - Evangeline May Williams Strickland, 92, died Saturday, July 23, 2016. Funeral services were held Monday, July 25, at Lancaster Funeral and Cremation Services, 804 N. Bickett Blvd., Louisburg, with the Rev. Leo Bennett officiating. Interment followed in Lancaster Memorial Park. DUAL THREAT. 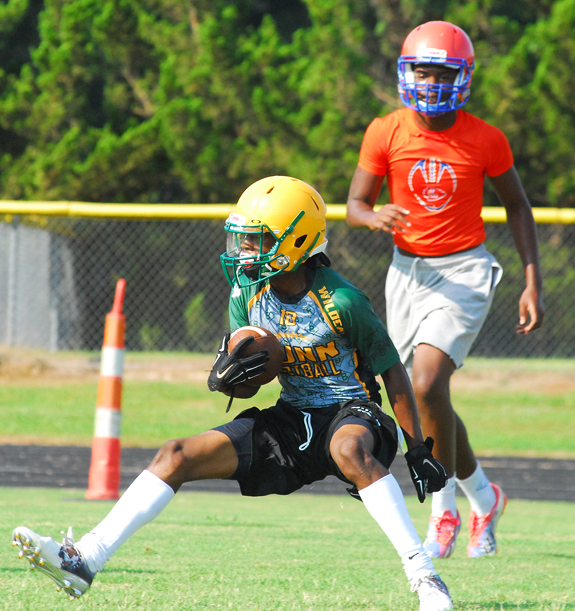 Bunn High School's Quenten Wright (with ball) could see action this year at both wide receiver and quarterback -- just as he did during Tuesday morning's 7-on-7 football scrimmage against Louisburg. BUNN - While Bunn's revamped offensive line is a question mark heading into the 2016, one area that isn't a source of concern is the Wildcats' embarrassment of riches at the skill positions. Even with all-time single-season rushing leader Tevin Perry now at Shaw University, the Wildcats are loaded at receiver, position and quarterback one year removed from their run to the state finals. CASH COLLECTS ANOTHER VICTORY. Town and Country's Shelby Cash speeds toward the finish line during last Thursday's contest against Winchester. RALEIGH -- Town and Country's Stingrays got almost two meets for the price of one as part of last Thursday's swim meet against Winchester. Two weeks ago, the squads made it halfway through an event before poor weather forced the end of the meet. 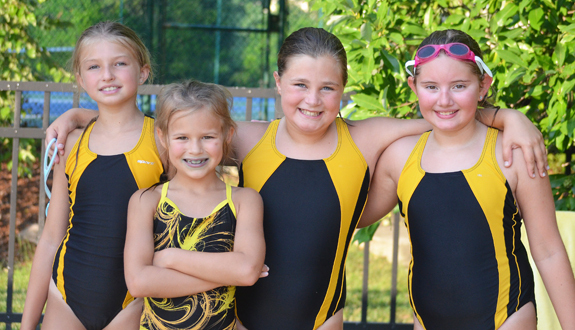 Last Thursday, the clubs met again and had a full meet -- and then finished the remainder of the postponed showdown. The makeup meet ended in Winchester's favor by a 127-62 total, and Winchester also won the scheduled contest 226-122. ON TARGET. 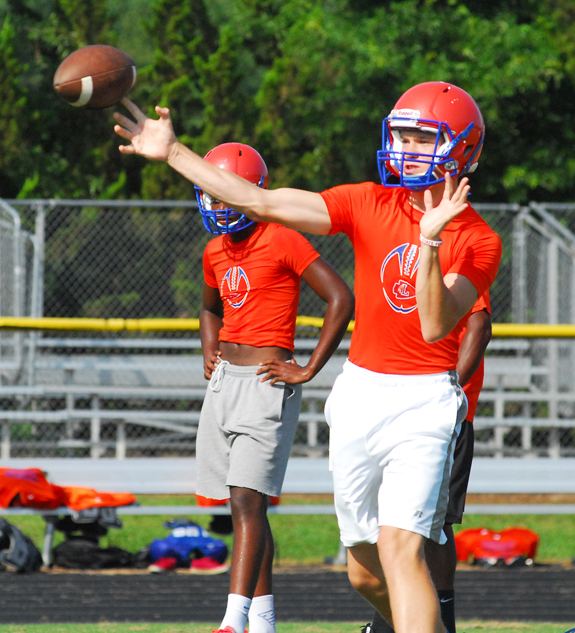 Louisburg High School quarterback Max Jones finds an open receiver. LOUISBURG -- When he became Louisburg High School's head coach before last season, Dontae Lassiter inherited a young offensive line group that was one year removed from one of the best units in school history -- albeit loaded with senior veterans. 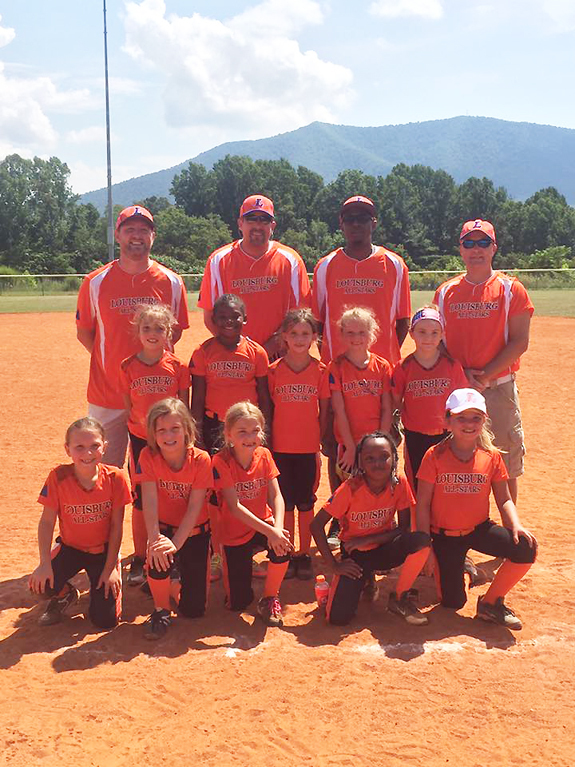 LOUISBURG -- All along, Coach Casey Lundy wanted his Louisburg All-Stars to gain valuable experience -- and have some fun -- at the annual Tar Heel 8-Under Coach-Pitch State Softball Tournament. Louisburg's roster featured a majority of younger performers who will return to this level next year. So Lundy used this season's state journey as a learning tool with the hope of making a long stay at the tourney come 2017. LYNCHBURG, VA. -- Caleb Beech allowed just two earned runs over a season high six and 2/3 innings pitched, but the Carolina Mudcats fell 5-2 to the homestanding Lynchburg Hillcats in the final contest of a five-game Class A Carolina League baseball series at Calvin Falwell Field in Lynchburg on Sunday afternoon. Beech (2-4, 4.26) suffered the tough luck loss in Sunday's game after allowing two earned runs, but five total, while pitching into the seventh. LOUISBURG -- Louisburg College's much-anticipated men's and women's cross country season will start Sept. 3 with a visit to the Chick-Fil-A Invite in Salisbury. LC, which is both the men's and women's defending region title holders, will host the Region X Championships Oct. 29 at Owens Park (formerly Bull Creek Golf Course). Louisburg will be coached by veteran skipper Jay Koloseus. RALEIGH -- Coming off their state runner-up performance last year, the Bunn Wildcats have accepted an invite to take part in the 2016 HighschoolOT Jamboree, which will be held August 13 at Cardinal Gibbons High School, which is adjacent to PNC Arena off Edwards Mill Road. 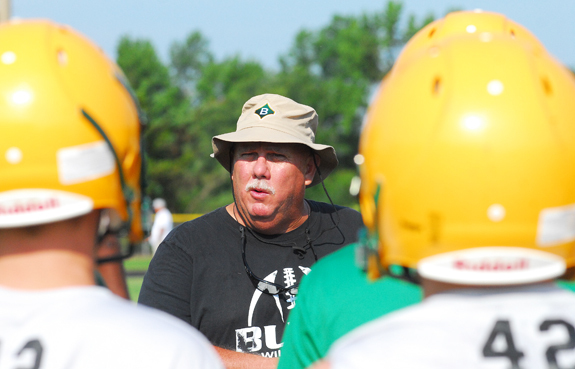 The Wildcats, coached by David Howle, will open the jamboree by conducting a scrimmage at noon versus the C.B. Aycock Falcons out of Wayne County. A total of 14 clubs will take part in one-hour scrimmage sessions. Louisburg's Octavius Scoggins (right) tries to shake away from a Bunn defender during Tuesday's action. Among the standouts this season for the Town and Country Stingrays Swim Team are (l to r) Caroline Merritt, Michelle Southall, Bailey Nelms and Caroline Holt. 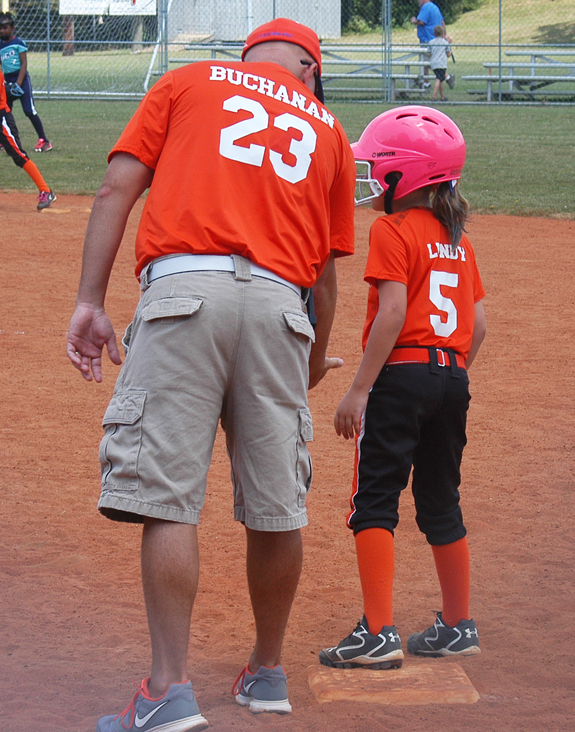 Louisburg All-Stars coach Deney Buchanan offers some baserunning advice to Paige Lundy during last week's appearance at the Tar Heel Coach-Pitch Girls Softball State Tournament. 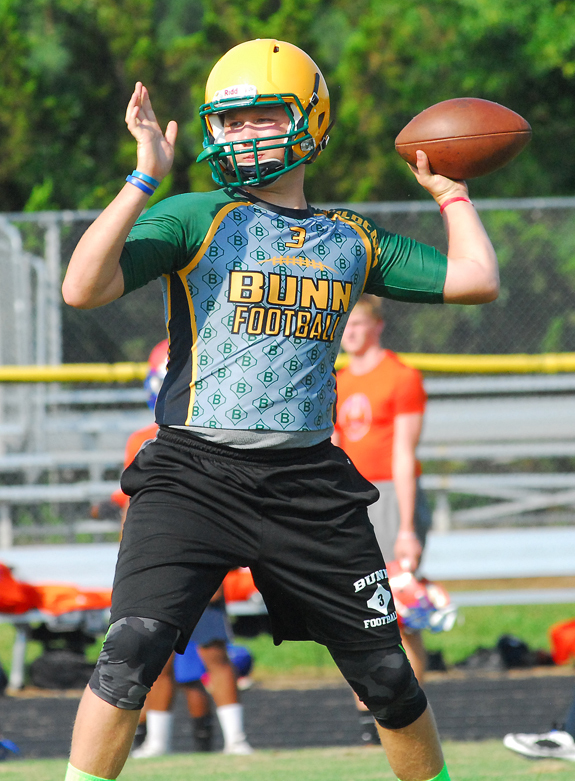 Senior Christian Murray hopes to earn playing time at the quarterback position this season for the Bunn Wildcats. Murray could also line up at tight end. 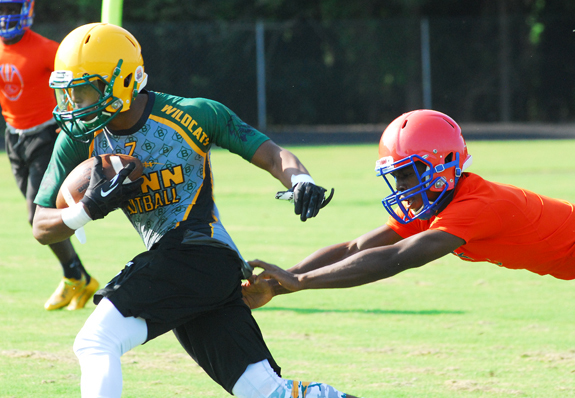 Bunn opens regular season action August 19 on the road against Wilson Fike. 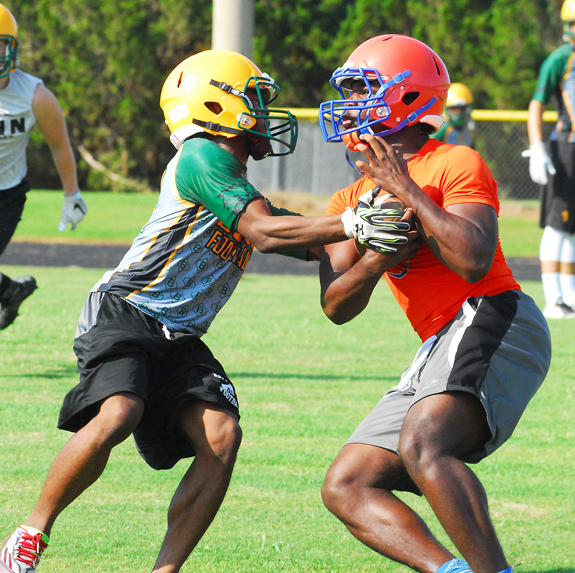 Bunn's Victor Dunston heads upfield after making a reception during Tuesday's 7-on-7 football event against the Louisburg Warriors. Sarah Strother Peoples and Zachary Ryan Isles were united in marriage on May 14, 2016 during a 5 p.m. outdoor ceremony at Lake O'The Woods Plantation in Inez, N.C. The double-ring ceremony was officiated by the Rev. Earl Dulaney. The bride is the daughter of Al and Marla Peoples of Louisburg. She is the granddaughter of Gene and Donna Rutter of Raleigh and the late V.A. Peoples and late Joyce Peoples. 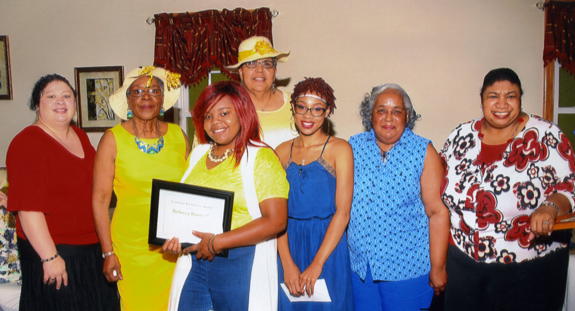 The Nu Epsilon Chapter of Alpha Pi Chi National Sorority, Inc. held its annual Rainbow Tea on recently at New Liberty Baptist Church. Two 2016 high school graduates were present to receive scholarships. Amani Rainey graduated from Early College and will be attending East Carolina University. Rebecca Braswell graduated from Louisburg High School and will be attending Vance-Granville Community College. Three other recipients were unable to attend due to other obligations: Samaria Carter, Destinee Cannady and Heather Pride. HENDERSON -- Vance-Granville Community College was recently recognized as the top two-year college in North Carolina for online programs, and, in a separate ranking, was named one of the top five two-year colleges in the state for the second year in a row. In its list of the "Best Online Schools in North Carolina for 2015-2016," the California-based organization, Accredited Schools Online (ASO), ranked VGCC first among all of the state's two-year institutions of higher learning. Franklin County Training School-Riverside Alumni announced their 2016 scholarship recipients recently who were presented at the Louisburg High School Awards Ceremony. 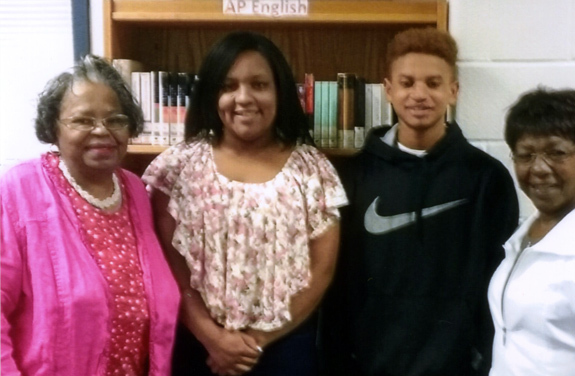 The students recognized were Erice Price, (second from left), who will be attending the University of North Carolina at Chapel Hill, and Frederick Weiner, third from the left, who has been accepted at Chowan University. With them are Mamie J. Jones, scholarship chairperson, (left) and Irma C. Bailey, alumni president, right. HOLDING ON. Former mayor and family friend Elic Senter presents Tracy Williams' family to the crowd, including her sister, middle, Michelle Williams, and Tracy's mother, Catherine. 'Violence is learned' ... and can be unlearned! FRANKLINTON -- This past Saturday, Safe Space Executive Director Monica Kearney attended her third vigil of the year -- remembering someone who lost their life to domestic violence. Changing her destination will take more than a navigation system. She said it will take charity, love and commitment, from everyone. "Many times in this journey, people ask: 'well, what can I do? What can I do to prevent this infectious disease that has infected our land like a parasite; that has consumed our families and our connections to each other?'" LOUISBURG -- Franklin County USDA Farm Service Agency (FSA) Executive Director Lindsay Rodriguez announced that producers who file accurate and timely reports for all crops and land uses, including failed acreage, can prevent the potential loss of FSA program benefits. "In order to comply with FSA program eligibility requirements, all producers are encouraged to visit the Franklin County FSA office to file an accurate crop certification report by the applicable deadline," said Rodriguez. BUNN ­­-- Four people arrested on drug charges are slated to appear in court next week. Franklin County sheriff's deputies targeted a mobile home park last week when they executed a search warrant on Scarboro Drive, arresting four people inside. During the course of the search, law enforcement personnel seized powder cocaine and marijuana. Deputies arrested Jeanie M. Bradshaw, 48, Ricky Bradshaw, 53, Franklin D. Jones, 50, and Travis W. Jones, 36, on drug-related offenses. 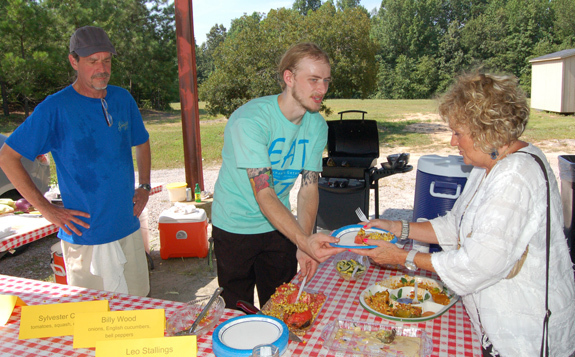 Chef Aaron Talbot, center, prepares a plate for Barbara Batts as Chef Michael Ward looks on. The two, who represent Michael's Getaway at Lake Royale and Michael's Showside Grill in Spring Hope, are working with the Franklin County Cooperative Extension office to prepare and serve up summer dishes with local produce available from the Farmer's Market. 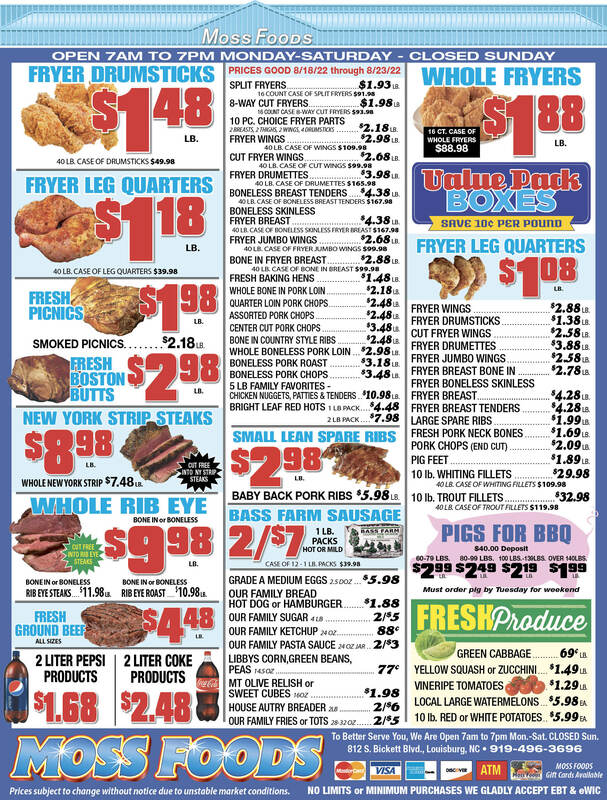 They will serve free dishes at the market each Tuesday from 9:30-11 a.m. through Aug. 30. FRANKLINTON -- With police shooting suspects and the community taking aim at officers across the nation, National Night Out festivities in Franklin County carry a bit more meaning, officers say. National Night Out is an annual, community-building campaign to promote police-community partnerships, neighborhood camaraderie and serve as an impetus to make neighborhoods safer. RALEIGH -- The U.S. Department of Agriculture (USDA) North Carolina Farm Service Agency (FSA) Executive Director Bob Etheridge is reminding farmers, ranchers and other agricultural producers that they have until Aug. 1 to nominate eligible candidates to serve on local FSA county committees. "The Aug. 1 deadline to submit nominations is quickly approaching," Etheridge said.